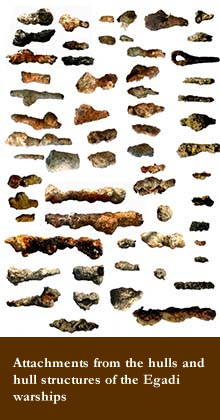 Based on the direct archaeological evidence some of the Egadi warships sank during the battle, suffered a great amount of degradation, and left debris on the seafloor. 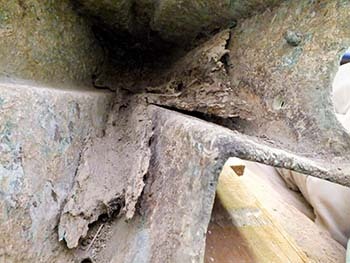 Analysis of the rams indicates, like all other rams, they were cast onto a specific warship bow; as such they offer a cast of the bow timbers from just behind the stem forward through the ramming timber. The bow of a warship, like any ship, is exceptionally useful in understanding the overall hull construction. Obviously without direct evidence from the stern it is impossible to make statements with certainty about its configuration, and a it is not possible to directly determine the shape at the turn of the bilge. However, the major structural timbers for which there is direct evidence will dictate parameters for overall vessel length and for the shape of the hull at its forward end. Wood has certain properties as a construction material that includes various shear and compression strengths, as well as flexibility in relation to thickness and shape. 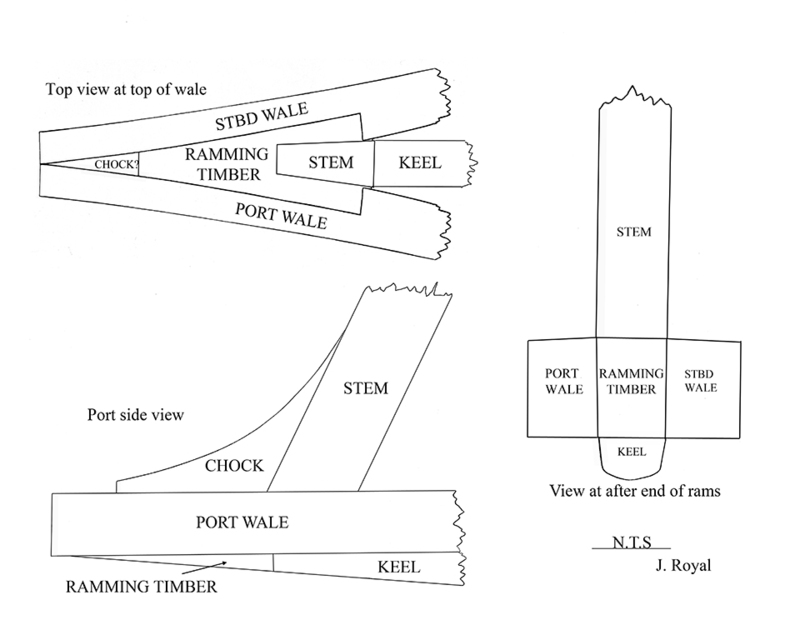 Measurements from the internal cavities of the Egadi rams provide the cross-sectional dimensions and shapes for the main structural timbers: keel, stem, and waterline wales. Below you can see the bow timber configuration for the Egadi warships. 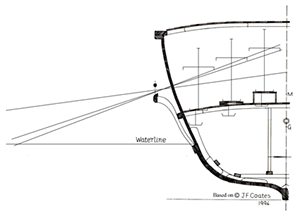 The dimensions of the keel are derived from the point aft of the stem, where the keel must have possessed its typical dimensions in order to maintain the hull’s structural integrity. Based on the cross-sectional dimension of the Egadi warships’ keels, they were closer to the size of the small Kyrenia merchantman and even the larger Athlit warship did not reach the dimensions of the 37-m Madrague de Giens merchantman. The Egadi warships were threes, wheras the Athlit warship is thought to have been a four. 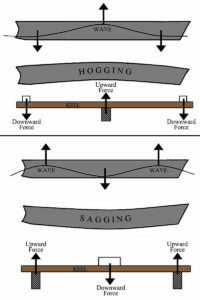 Robust keels were even more critical for vessels with high length-to-beam coefficients (warships) as they are more susceptible to hogging and sagging forces. Rounded merchantman hulls had length-to-beam coefficients of around 3:1, which created a near dome – a shape extremely resistant to hogging and sagging forces. However, elongated warship hulls had a much less effective shape. The bottom plates of the Egadi rams indicate the keels must have been rockered on these warships; such a design would be a logical measure to provide greater longitudinal support and resist hogging and sagging forces. Even rockered, the keels overall cross-sectional dimensions indicate the Egadi warships could not have supported a hull of 40-m in length as is often hypothesized for threes, rather on the order of 27 m in length. Have extensive dataset of ancient hulls, techniques for building, materials used. based on comparative construction mortise-and-tenon hulls, frames attached to planks and some to frames; attachment evidence – have spikes typical of frame-keel and frame-plank attachments, to smaller ones that appear to be for non-structural attachment such as ceiling planking, benches, or perhaps outriggers. Hulls of approx. 27 m in length would indicate warships of approx. 4 m in beam and a draft of approx. 2.5 m. Unlike the hypothesized threes such as the Olympias, these vessels would fit in the shipsheds, indirect evidence, that are contemporaneous with the Egadi warships. The size of the Egadi warships precludes there having superimposed tiers of rowing stations as is hypothesized for threes in the 5th century BCE. Given the freeboard and necessity for sailing, the Egadi threes had a single bank of oars that likely passed through outriggers. If the number of individuals on board threes of the 3rd century BCE included 170 rowers, although there are no direct statements for his in the historical evidence, and that the warships’ sized dictated a single bank of oars, then there were multiple oarsmen per oar. With the ability to model warships in computer programs that take into account the properties of wood and effects of waves, we can learn even more about construction and operations. Such a project is now underway through student research at the Maritime Studies Program, East Carolina University.